Throughout most of the 1940's, Matt Cvetic worked as a volunteer undercover agent for the FBI, infiltrating the Communist Party in Pittsburgh. In 1949, his testimony helped to convict several top Party members of conspiracy to overthrow the U.S. government. Cvetic sold his account to "The Saturday Evening Post" and it was serialized under the title "I Posed as a Communist for the FBI". It later became a best-selling book. In 1951, Warner Brothers released a film based on these accounts entitled "I Was A Communist For The FBI", starring with Frank Lovejoy as Cvetic. In 1952, in the midst of the Red scare of the 1950's, the Frederick W. Ziv Company produced the syndicated radio series with the same title as the movie. It was produced without assistance from the FBI, which refused to cooperate. 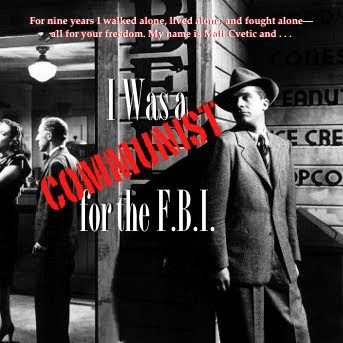 I Was a Communist for the FBI consisted of 78 episodes syndicated by the Frederick W. Ziv Company to more than 600 stations, including KNX in Los Angeles, California, with original episodes running from April 23, 1952 to October 14, 1953. Each episode ended with Dana Andrew's well-remembered words, ""I was a Communist for the FBI. I walk alone". The show had a budget of $12,000 a week, a very high cost to produce a radio show at the time. This is fantastic! Thank you for this link! Fascinating!